in such resident entities, ie Managing Director, Director, Partner, Trustee, Author, Founder, Karta, Chief Executive Officer, Principal Officer or office bearer of the entities as mentioned above. Such personnel would also be required to apply for a PAN (if not already allotted) within the prescribed timeline. However, the timelines within which PAN was to be applied for by the resident entities or its key personnel had not been prescribed,” says Akhil Chandna, Director-Tax, Grant Thornton India LLP. 4. 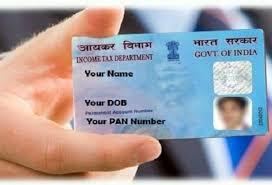 Apart from the above rules, some other PAN card rules have also been introduced by the government during the last year. For instance, the Central Board of Direct Taxes (CBDT) added another option (i.e. ‘Transgender’) in Gender column of Form 49A/ 49AA (for PAN Application), against the earlier options of ‘Male and Female’ for Individual Applicants, vide Income–tax (Fourth Amendment) Rules, 2018 Notification No. 18/2018, dated 9 April, 2018. Thus, promoting equal rights for every citizen, the PAN application form is now having the option of Transgender, in addition to Male & Female.